In this booklet, Gran'pa Jack asks: Will ''gun control'' make you safer? This new booklet is perfect for today's hectic society where people have very little time to read or do critical thinking about freedom issues. Gran'pa Jack #6 makes it easy. 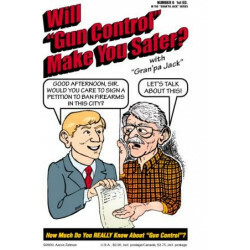 We designed ''Will Gun Control Make You Safer?'' to reach people who are confused by deceptive ''gun control'' ideology. Personal and family safety is on everyone's mind. If we can reach these people, then we can win many of them to our side.